This portion of the Fall Creek Gorge runs through the northen portion of the Cornell University campus in Ithaca, NY. 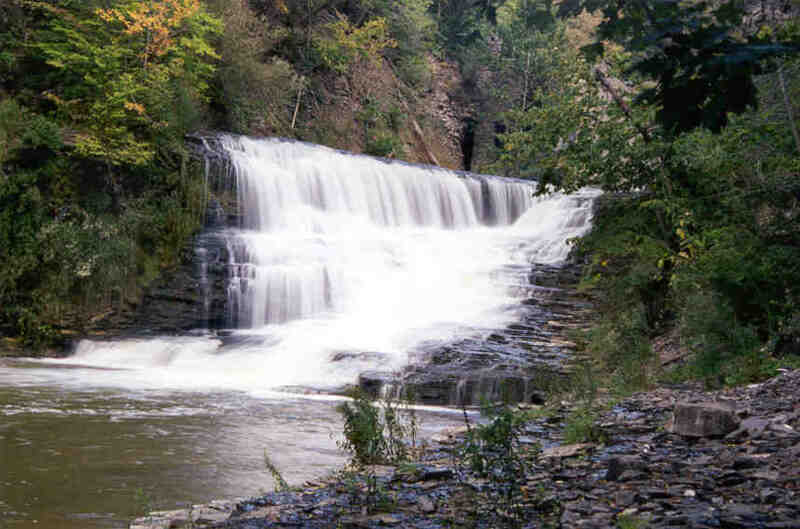 Like its neighbor on the southern edge of the campus - Cascadilla Gorge - it consists of a series of beautiful waterfalls. There are several different points from which you can see the various waterfalls of Fall Creek gorge. It would be difficult to take one continuous walk that would include all the falls. I have included directions to some of the access points in the description below, but of course there are other ways that the gorge can be enjoyed. Taking a look at a map of Cornell will be helpful in understanding the directions if you are not familiar with the area. The part of the Fall Creek Gorge included on this page is within the Cornell University campus. Ithaca Falls is also on Fall Creek, but it lies just outside the boundaries of campus. Fall Creek Gorge is like Cornell's other gorge, Cascadilla Gorge, in a number of ways: it contains a series of about a half a dozen waterfalls; its beauty is slightly lessened by its proximity to man-made structures; it is the subject of an unwarranted reputation, being perhaps best known for suicide attempts. However, Fall Creek differes from Cascadilla in that it has much more power and volume, bigger falls, more students, and more man-made disruptions. Starting on the east, and moving downstream, Lover's Falls comes first. To reach this falls, drive east on Forest Home drive from its intersection with Thurston and East Avenues. Park on your left, at the end of Beebe Lake. Cross the bridge over Fall Creek, and turn right onto a trail along the stream. Soon, you come to a fenced in terrace, known as Lover's Leap. From here is a nice view of little Lover's Falls, or you can walk further to get a closer look. At the other (west) end of Beebe Lake is 85 foot Triphammer Falls. The bottom of the falls is visible from the Thurston Avenue bridge over the gorge. To get a closer look at the upper portion of the falls, walk onto the footbridge that is visible from the Thurston Ave. bridge. From here, you can see the waters cascading over the dam that forms Beebe Lake. The same location in winter is also a nice scene. The next part of the gorge is slightly less accessible. From the Johnson Museum of Art on University Avenue, cross the street and walk down the stairs into the gorge. This will bring you to the Suspension Bridge. The waterfall shown on this page is located directly underneath this. Continue down the steps to the bottom of the gorge at a popular swimming spot at the base of the falls. Another fairly large falls is visible from the Stewart Avenue bridge over the gorge. Check out the Virtual Tour of Fall Creek and Beebe Lake, created by Cornell (you'll need Quicktime to take the tour).